Admire a classic ambiance that radiates light and color – including a real stone piazza alongside spectacular and sweeping Swarovski crystal grand staircases and a magical ‘infinity’ pool. Relish in award-winning favorites such as the MSC Aurea Spa with beauty and wellness treatments that melt every tension away. Experience the secluded luxury of MSC Yacht Club, a ship-within-a-ship of exclusive suites, butler service, dedicated facilities and private decks – all offering privileged access to the world-class leisure on board, including a full-gaming casino and Broadway -scale theater. Discover innovations exclusive to MSC Preziosa like the delicious Eataly slow food gastronomy, the refined Top 18 adults-only sun deck complete with spa treatments and the Tiki bar for kids and teens. From the splash-packed fun and games of the Doremi Castle kids aqua park, clubs for kids and teens, the swooping thrills of Vertigo, the longest single-rider water slide on the seas, awarded ‘Best Innovation’ by Cruise International in 2013. Dine in the open-kitchen Galaxy restaurant boasting delicious all-day dining and a panoramic disco that keeps the beat ’til late ensures the fun continues into the evening. 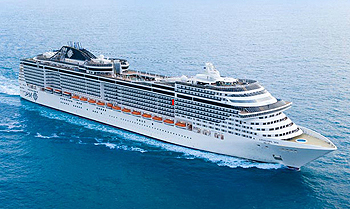 View all MSC Preziosa cruises, view a selection of MSC cruise deals, or view more options for MSC Cruises. The exclusive 24-seat evening-only Ristorante Italia offers a different ultra-high-quality table d hoe menu every night, specially conceived by the Eataly chefs. The menus feature a variety of dishes made using ingredients sourced through the Slow Food Foundation – created to protect small producers and to preserve the quality of local produce. In the authoritative and informal atmosphere that characterises all Eataly restaurants, you can focus on the food itself, pairing each dish with a glass of wine and learning something new every day on a magnificent culinary journey. Do you dare to take the plunge and experience the wildest ride on the seas? Starting way up on deck 18, Vertigo offers a thrilling journey through 120 metres of twists and turns. Bands of colour create a wonderful strobe effect as you zip through the tube. And when it shoots out over the edge of the ship, you will enjoy amazing views of the sea below – if you are brave enough to keep your eyes open!